When we think of some of the most enduring romantic pairings in all of comic books, there are several that come to mind. Whether they be Superman and Lois Lane, Spider-Man and Mary Jane or the Flash and Iris West, each of these couples have managed to find each other, no matter what medium it be. 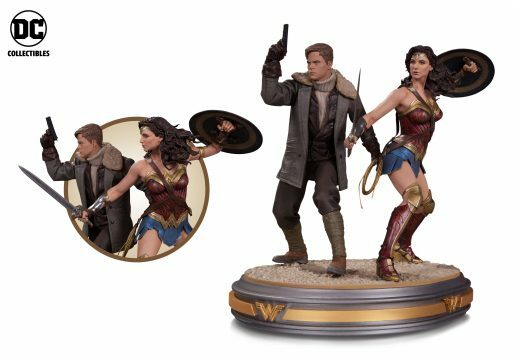 But one that mainstream moviegoers may not be as familiar with is that of Wonder Woman and Steve Trevor, something we fully expect to change come June 2. We say that because the relationship shared by these two characters is one of the core elements of the upcoming film, prompting director Patty Jenkins to say in a recent interview that she hasn’t “seen a couple like this onscreen in a long time.” And from what we can tell by each subsequent trailer released, stars Gal Gadot and Chris Pine have the chemistry to make it work. Having said that, we’re proud to offer you the chance to own a piece of history today. Specifically, a gorgeous statue depicting this power couple ready for battle, one that stunningly captures the likenesses of the respective actors set to bring them to life this summer. Standing at 13.32 inches and limited to 5,000 units, it’s hard to imagine any fan passing up the opportunity to own this DC Collectibles beauty. Sure, you could pay $275 in stores or online, or, you could simply re-Tweet the contest message below and follow us on Twitter. After that, you’ll just need to sit back and wait patiently, as a winner will be notified via DM on May 31st.